A series of posts exploring the possibilities of using the Pi Zero as a USB MIDI device. The previous post was "play us a tune" and the next is "Two things at once". At the end of the last post we had a Pi Zero that would send a MIDI file over the USB port to an attached computer causing an audio program, in this Apple Garageband to play out a tune. The computer also provides power over the same USB cable so it's all plug-and-play. 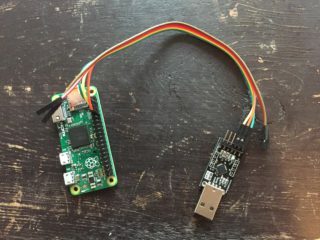 This post focusses on being able to talk to the Pi Zero over a serial connection and get it to behave as a USB MIDI Gadget. The main issue is that the USB port can be configured to be either an ethernet cable—so it can be controlled, or a MIDI interface—so it can send MIDI commands but not both. This loop is really frustrating so what we want next is a way to control the Pi Zero and be able to control MIDI messages at the same time. The Pi's GPIO pins can be used as a serial interface and in fact, when you boot it up it's sending serial data about the boot sequence already. Using a USB-TTL/UART cable you can log into the Pi over the serial GPIO interface whilst the USB interface is pretending to be a MIDI device. Adafruit sell this one and the one I used looks more like this. The USB-TTL convertor has the a few wires but only 3 of them need to be connected. Make sure that TX on the Pi goes to RX on the cable and vice vera. I lost a lot of time wondering why it didn't work because I'd connected TX to TX and RX to RX. At first I saw a blank screen, but hitting enter displayed the familiar login prompt for the Pi. Entering the password will give you the usual terminal access to the Pi. Ctl-C will stop the MIDI playing. This is quite powerful as it shortens the write-test-debug loop and it lets me see any log messages and make changes as the code is running. Some useful commands when using screen as Ctl-A d (hold control, press-A, release control, then press d) will detach the terminal from the session but will keep the connection open in the background. screen -r will re-attach to the session. Ctl-A c will close the session completely. This approach has one major drawback. The Pi Zero can talk to your computer but not the network. The trick of Internet Sharing in the previous post doesn't work because communication is happening over serial and not the virtual ethernet bridge. There is a way to do it but it took me hours to get it working and felt like travelling back in time to the internet past. The solution is to use Point-to-Point Protocol, that thing we used to connect modems to our ISP, to bridge the Pi Zero serial connection to the network. These steps need the internet, so I enabled g_ether and connected to the Pi Zero with Internet Sharing. 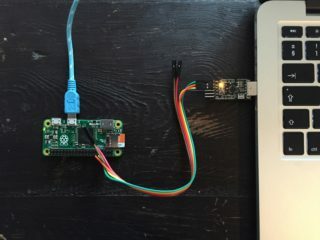 This would create a PPP connection giving the Pi Zero the IP 192.168.0.101 and connecting to the laptop which will be 192.168.0.100. That's the Pi Zero configured. pppd would now start on boot and try to connect over serial to another computer. I'm using a Mac with OS X 10.11 El Capitan. This may be different on other versions. The USB-TTL cable may need specific drivers. You should install these and then make sure that the correct device appears when you plug the cable in. In my case /dev/tty.SLAB_USBtoUART appears. This is telling the Mac to pass packets from our end of the PPP connection through to our network connection on en0 which for me was my wifi connection. It might be different if you use an ethernet connection or a different wifi card. load anchor "100.customNATRules" from "/etc/pf.anchors/customNATRules"
/dev/tty.SLAB_USBtoUART is the address on the Mac of the USB to TTL converter cable. Depending on which drivers are installed, this could be different. Running the following long-winded command will connect the serial connection via the USB-TTL cable and assign the other end the IP address 192.168.0.101. Setting nopersist above will cause pppd to exit when you unplug the USB cable. Set to persist if you want it to stay running and to try to reconnect automatically. Although, if you close the terminal window or restart the Mac then it will exit. I could ssh into the Pi Zero on the static IP I had given it via the PPP link i.e. Now you should be able to ping an external IP from the Pi Zero e.g. PING 212.58.246.78 (212.58.246.78) 56(84) bytes of data. That confirms that the Pi Zero has a connection to the outside world. Although there are quite a few moving parts, having PPP providing a network bridge between the serial port of the Pi Zero and the Mac's network means we can interactively control the Pi Zero whilst it's in gadget mode. This should be really useful for building the types of gadgets that rely on user interaction and are non-obvious in how they behave. Having another cable isn't ideal though. It would be great if the Pi Zero could behave like several gadgets over the same USB cable at the same time. Interestingly enough, this blog post suggests that's possible and that'll be the subject for the next post.